When home prices begin to fall, a natural level of weak support may develop around a loan-to-value ratio of one. That is, when equity in a home approaches zero, the homeowner ought to become reluctant to sell. History suggests any such strategy should prove foolhardy. Trends in housing tend to be long and headstrong, and hence not easily resisted…The development of significantly negative home equity among the same homeowners that also comprise the world’s most voracious consumers would likely trigger several economic problems…banks would become reluctant to lend to home buyers. The effect would be to contract the credit available to would-be homeowners and therefore severely undercut the main late-cycle driver of demand…These problems would compound the worsening domestic employment situation, further reducing demand for residential housing and thereby producing the requisite positive feedback loop that historically has allowed burgeoning asset deflation to accelerate. As the real estate deflation wears on, it would not be unreasonable to expect that unemployment-induced income shocks mix in toxic fashion with the comparatively high mobility tolerance of the United States citizenry, motivating homeowners to start sending their keys to the bank in ever-increasing numbers. Many banks taking possession of increasing amounts of real estate will ultimately fail themselves. A catharsis could then take shape, and home prices would leg down yet again. After much pain both despair and disgust will settle in, and a bottom would begin to form. Inspired by a personal experience, a businessman began delving into the practices of the mortgage industry, including Fannie Mae. His findings have been prescient. Regarding MERS, a few months ago I read that MERS was actually conceived by Fannie Mae and the concept was described in a presentation given at a Mortgage Bankers Association convention in 1993 or 1994. The article claimed Fannie got positive feedback on the MERS concept from the mortgage bankers. The article claimed that Fannie Mae and Freddie Mac then funded the development of MERS with contributions of 2 million dollars each. After MERS was 'brought live' Fannie and Freddie invited large mortgage industry members to join MERS on a subscription basis. I've searched again for the article(s) recently, but I haven't been able to find the articles that described the actual creation of MERS. Perhaps the articles have been "scrubbed". Three step test for a duck: (1) If it walks like a duck (2) Looks like a duck (3) And, quacks like a duck. It is, more than likely, a duck. Inside the D. C. Beltway definition and semantics are tortured to death by people who strive to gain (or, strive not to lose) by blurring the lines of the meaning of what is . . . .
An aside: I discovered the nature of lobbying, twisted definitions, and semantic reclassification while studying the history of Section 28(e) of the Securities Exchange Act of 1934 (as amended in 1975). The amendment originally described the allowable uses of investment advisors’ clients’ ‘brokerage commissions paid-up above the fully-negotiated costs of brokerage transaction execution’ (soft dollars). When passed, this amendment never mentioned any difference in the treatment institutional agency brokerage commissions arrangements, as compared to institutional full-service bundled undisclosed brokerage commission arrangements. On the subject of capital investment, and the taxation of capital gains, it seems to me that almost all of the media has missed an important point, and several lesser points that flow from that central point. Capital investment pays for (or finances) what Karl Marx called “the means of production”. In a free capitalistic market individual investors decide where they want to invest their money, how much risk to take with their money, and whether they are going to invest in, for instance, the manufacture of cell phones or the activities of grocery stores. Or, they can decide if they want to invest in solar panel manufacturers (like, Solendra?). If individual investors are not incented to invest their capital in “the means of production” it seems the alternative is for government to use taxpayer funds for investment and use some form of ‘central planning’ to decide in which enterprises the taxpayers taxes will be invested. It’s been pointed out by several in the media that capital investment actually produces taxable revenue when the enterprise must pay a tax on revenue. And, it’s been mentioned that the investor then pays another tax (the capital gains tax) - if the investor is fortunate, or smart, enough to make a capital gain. However, I’ve not seen any media (or reporters) mention that there is usually another source of taxable revenue which flows from capital investment. Capital investment generally contributes to job creation. Most of the people who are employed in the investors’ enterprise will have an income – some of which is taxed. And another point, which also seems subtle to the press, the part of those workers’ income which is not taxed can be used by the workers to consume, save, or invest. These worker activities (consumption, saving and investing) all add value to the economy, and they produce jobs and more (downstream) revenues which are taxed. I believe myriad individuals participating in a relatively free market, and making judgments about products to be offered while making judgments about demand levels for those products, and evaluating risk-and-reward payoffs, is a far more efficient, objective, and practical way to finance ‘the means of production’ than any central planning scheme. If you are not familiar with MERS do a key-word-search for more information. Mr. Speaker, I rise to introduce the Free Housing Market Enhancement Act. This legislation restores a free market in housing by repealing special privileges for housing-related government sponsored enterprises (GSEs). These entities are the Federal National Mortgage Association (Fannie), the Federal Home Loan Mortgage Corporation (Freddie), and the National Home Loan Bank Board (HLBB). According to the Congressional Budget Office, the housing-related GSEs received $13.6 billion worth of indirect federal subsidies in fiscal year 2000 alone. One of the major government privileges granted these GSEs is a line of credit to the United States Treasury. According to some estimates, the line of credit may be worth over $2 billion. This explicit promise by the Treasury to bail out these GSEs in times of economic difficulty helps them attract investors who are willing to settle for lower yields than they would demand in the absence of the subsidy. Thus, the line of credit distorts the allocation of capital. More importantly, the line of credit is a promise on behalf of the government to engage in a massive unconstitutional and immoral income transfer from working Americans to holders of GSE debt. The Free Housing Market Enhancement Act also repeals the explicit grant of legal authority given to the Federal Reserve to purchase the debt of housing-related GSEs. GSEs are the only institutions besides the United States Treasury granted explicit statutory authority to monetize their debt through the Federal Reserve. This provision gives the GSEs a source of liquidity unavailable to their competitors. Ironically, by transferring the risk of a widespread mortgage default, the government increases the likelihood of a painful crash in the housing market. This is because the special privileges of Fannie, Freddie, and HLBB have distorted the housing market by allowing them to attract capital they could not attract under pure market conditions. As a result, capital is diverted from its most productive use into housing. This reduces the efficacy of the entire market and thus reduces the standard of living of all Americans. No less an authority than Federal Reserve Chairman Alan Greenspan has expressed concern that government subsidies provided to the GSEs make investors underestimate the risk of investing in Fannie Mae and Freddie Mac. Mr. Speaker, it is time for Congress to act to remove taxpayer support from the housing GSEs before the bubble bursts and taxpayers are once again forced to bail out investors misled by foolish government interference in the market. I therefore hope my colleagues will stand up for American taxpayers and investors by cosponsoring the Free Housing Market Enhancement Act. During a December 15, 2010 House of Representatives Judiciary Committee Hearing, Representative Bobby Scott [D. VA] asked those testifying if there was anything in "accounting standards" that was causing the mortgage industry not to accept ‘short sale offers’ and to seemingly prefer going to foreclosure. No testifier apparently knew of the impact the delay in the implementation of mark-to-market accounting [FAS #157] has on loss recognition accounting; but Thomas Cox (an Attorney in Maine) explained another reason for the apparent rejection of 'short sale' offers. I recently watched a U.S. House of Representatives Judiciary Committee Hearing on C-SPAN. The hearing, which was held on December 15, 2010, was titled “Mortgage Services and Foreclosure Practices”.1 The testimony and the questions and answers in the hearing provided a significant amount of interesting information about the processes, and the legal and practical issues surrounding the mortgage servicing industry, and the Mortgage Electronic Registration System (MERS). Because I followed the history of Congress’s involvement in pressuring the Financial Accounting Standards Board (FASB) to delay the implementation of FAS #157 in early 2009.2 I found a question, which was asked by Congressman Bobby Scott (D. VA) troubling. At approximately 1 hour 36 minutes into the hearing Congressman Scott asked, in essence, if there was anything in “accounting standards” that might provide incentives for mortgage investors and mortgage servicers not to agree to short sales and to prefer alternatives that might be less advantageous for all parties. 3. Under the typical mortgage securitization “Pooling and Servicing Agreements” mortgage investors agree to pay mortgage servicers fees for arranging: home inspections, arranging broker ‘opinion of value’, preparing and filing documents, general documentation, notifications, forced insurance fees, and etc. What happens when a hedge fund strategy "blows-up"? The manager moves-on to a different strategy, and most likely, a different group of investors. Picking the bottom of any market is a timing issue, by the time these hedge fund "lock-ups" have expired most of the investors will probably start to see signs of life in the housing market and will decide that after a couple years of pain, during the "lock-up", it's probably a good idea to hang-in-there and perhaps enjoy some profit. In my opinion the hedge fund managers in this article are following a contrarian strategy and may be quite early . . . but, it takes time to convince those hedge fund investors to invest. Remember, home prices change at the margin, one-sale-at-a-time, the next sale is based upon comparable sales and an appraisal - and in most cases - the completion of the sale is dependent upon the availability of mortgage financing. Watch unemployment and don't just look at the published numbers for mortgage interest rates, look at the number of new mortgages actually issued. If what used to be a qualified buyer can't buy, the excess inventory will not be absorbed by anybody but investors who want to be landlords. 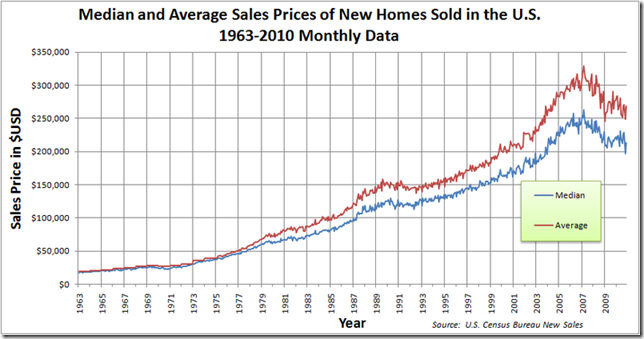 I believe Mr. Mark Hanson (in the article) has the proper current view of the housing market.